Early spring is a time of rebirth, not only for the earth, but also for your mountain bike. It’s time to get it prepped and ready to ride after its long winter’s nap. This is aimed at getting you riding and much of this work can be done from home. Many excellent tutorials are also available online and in various reference guides. If you feel uncertain about doing any of these repairs yourself, please consult your local trusted bicycle mechanic. 1) Tire Pressure Check – All bike tubes or tubeless tires systems will lose air over time. If you don’t have one already, get a good floor pump with a pressure gauge and follow the inflation specifications listed on your tire’s sidewalls. 2) Tire Tread Check – Check your tires treads for wear and replace if necessary. If your bike runs the same tires front and back, it is possible to do a “replacement rotation” – replace your front tire with a new tread and rotate your older front tire to the back. Traction from the front tire is your first line of defense when turning and cornering. Also, check for tears in your tire’s sidewalls and replace if you find any. If you run tubeless tires, check your tire sealant at least semi-annually to make sure that it hasn’t dried up. The hotter and drier the conditions you ride in, the more often you should check to make sure that your sealant hasn’t dried up. This, of course, may not be an issue with us Northeasterners and our typical wet spring weather! 3) “Touch Points” Check – The “touch points” are where you personally come into contact with your bike – the grips, saddle and pedals. Do your grips look like worn out pencil erasers? Is your saddle ripped? Are the rails under the saddle straight? Do your pedals have any side-to-side play? If so, it might be time to replace some of these touch points. If you ride with clipless pedals, check your cleats for wear and replace them if need be. Remember to grease the threads on the cleat bolts when reinstalling. This can save you time and effort for your next cleat change. 4) Wheels Part I – Check both wheels to make sure they are straight and round – straight in that there is little side to side wobble and round in that there is no “hop” in the rim. Check the spokes so make sure that none are loose. A home truing stand, a set of spoke wrenches, and a variety of video tutorials come in handy for this job, especially if you have to maintain a fleet of bikes as we do in our own home. Remember, turn left to tighten and right to loosen, working in quarter turns, and checking your work frequently. Check your hubs to make sure that there is no side-to-side play – that you do not feel looseness when attempting to move the wheel from one side to another. Hub play might indicate either a minor adjustment with a set of cone wrenches at best or a bearing replacement at worst. 5) Wheels Part II – Make sure that your quick release or thru axles for your wheels are secure. Even experienced riders such as myself have accidentally bypassed this small but important detail. In a hurry to ride a newly built BMX bike, I once forgot to fully tighten the front wheel, and it nearly came off mid-air. Lesson learned. 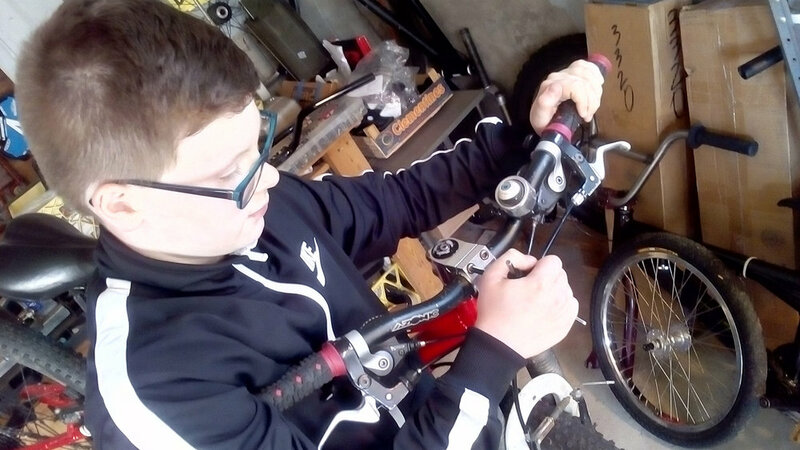 6) Front to Back Nut and Bolt Check – Starting from the front of your bike and working to the back, check all bolts to make sure that they are secure. Be careful not to overtighten, however. Many components helpfully now list torque specifications, and I recommend that you invest in torque wrench that can be set in inch pounds (or Newton meters) as most bike parts work in that lighter range. There are many low cost preset torque wrenches available. These wrenches are generally set for five Newton meters, which makes them perfect for correctly tightening your stems, handlebars and seat post clamps. Prior to owning one of these tools, I have personally snapped a many fancy stem plate due to over tightening. Like many others, I am not a great gauge at tightening bolts and tend to overdo it a bit! 7) Brake Check – Most mountain bikes run some form of hydraulic disc brakes today. A quick brake check includes the following. First, eye your rotors to ensure that they are true – that there is no side to side wobble that hits the brake caliper, therefore interfering with the wheels ability to freely spin. Second, check that the brake calipers are centered over the rotor. If it is not centered, the rotor will rub on one side or the other of the caliper. A quick fix to this is to slightly loosen the caliper bolts, squeeze the brake lever and then tighten the caliper bolts lightly, alternating between the top and bottom bolts. Third, check your pad wear, especially in your rear brake caliper. You can do this by eyeing the amount of pad remaining. The general recommendation is that they should be changed when there is less then three millimeters of pad left. Most brand-specific disc pad replacements come with excellent instructions. Last, check your caliper “feel.” If the brake lever feels “mushy” or if it rebounds slowly after being squeezed, your brakes will need to be bled, replacing the system with new brake fluid. If you have not bled brakes before, I recommend that you work with a local bike shop as there are many variables and fluid types involved in this process. 9) Suspension Check – It’s a safe bet to say that almost all mountain bikes come with front suspension forks today and that dual suspension bikes are steadily becoming the new norm. A quick suspension check should include the following. First, check and reset your air pressure if you have air sprung suspension. Many forks nowadays have recommended air pressure charts listed on their fork legs or in the instruction manual. You will need an air shock pump for this job. Second, wipe down and inspect your fork seals. The seal is the rubber ring between the lower and upper part of your fork. Wipe away that ring of grime and oil there from last season by using a Q-Tip. If you have rear suspension, do the same on that shock. If you find oil running down the shock from the seal, please have your suspension serviced at a local bike shop. A word of caution: Don’t use lubricants like Tri-Flow on your seals as it contains solvents. Over time, those chemicals will degrade the quality of the rubber in your seals. 10) Drive Train Check – Your drive train consists of the parts that keep you moving forward – the chain, gears, shifters and cranks. First, degrease and clean your chain, cassette and front chain rings. Scrub it with an eco-friendly citrus degreaser, rinse lightly with water, then dry before lightly lubricating your chain. Next, check the shifting. In a bike stand, run your gears up and down your rear cassette, adjusting the barrel on your derailleur (if Shimano) or on the barrel adjuster of your shifting pod (if SRAM) in the direction of the movement of the chain up or down the cassette. Shift happens, let’s make sure that they’re intentional while you’re riding! Last, check your bottom bracket for side-to-side play. With the bike out of the stand, check for play by holding a crank in each arm and wiggling them side to side. Retighten your crank arm bolts if you find any play. If it remains after retightening, consult with your local shop. You may need to replace your bottom bracket, which are the bearings that support your crankset in the frame. Bonus Tip: Check Your Head – Check your helmet’s replacement recommendation. If you have crashed and hit your helmet, replace it immediately – no ifs, and or buts. I replace my helmet every season. You can always replace your exoskeleton, but not your head.